Tsukishima is a small man-made island in Tokyo Bay, right next to Tsukiji on the mainland. For the bargain hunter, it’s Monjatown. Monjayaki (monja for short) is the uniquely Tokyo variation on okonomiyaki, a dish you cook yourself on a sizzling hotplate set into your table. 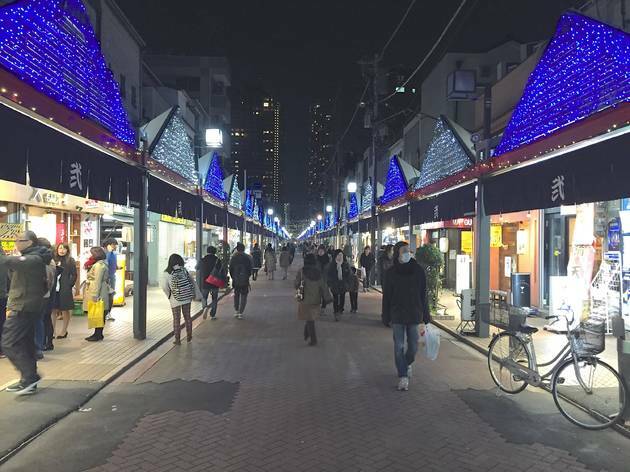 There are around 80 places specialising in monja and okonomiyaki in the main street (called Nishinaka-dori), or in neighbouring lanes and alleys. 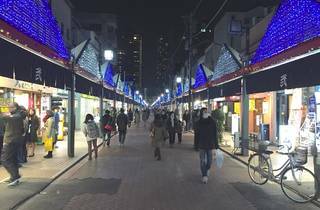 The main street is closed to traffic in the early evening, allowing visitors to sanpo (stroll) and check out the rice cracker shop, the melon pan bakery, the little shop selling cookery utensils, or the Mexican-themed bar. Eventually visitors gravitate towards one or other of the monja joints, or perhaps a yakitori joint, or one of the several other similarly-priced alternatives. Most people settle on the monja, as it’s cheap and a novel dish that makes a good talking point. Don’t wear your best clothes – stash anything you don't want to come out reeking of the grill in the plastic bag provided to keep your duds smelling fresh. Later in the evenings, taxis are permitted into the street to allow groups of partygoers to make their way home safely.